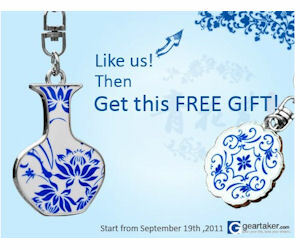 For the next 4 days Geartaker will be giving away 100 free chinese porcelain keychains. Like Geartaker and click on the ‘Freebie’ tab. Click the ‘Click here’ link and another page will pop up allowing you to claim your free Blue and White Chinese Porcelain Keychain. These are available to the 1st 100 everyday, so you have to be quick. Geartaker has announced the giveaway will go live at 9pm EST. Click on check availability on this link.